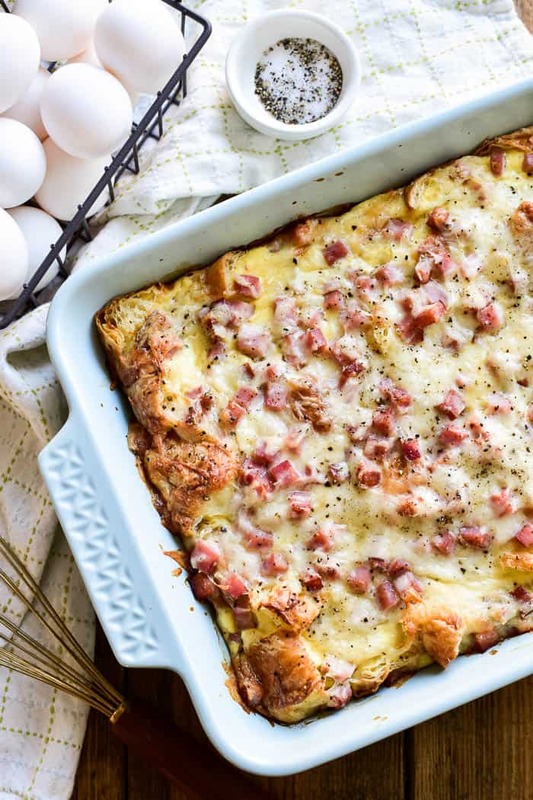 This Ham & Cheese Croissant Egg Bake is the ultimate breakfast dish. It combines the classic flavors of ham & Swiss in a delicious breakfast strata that’s ideal for entertaining. Made with just 8 simple ingredients, this egg bake is prepared the night before and oven-ready when you wake up. 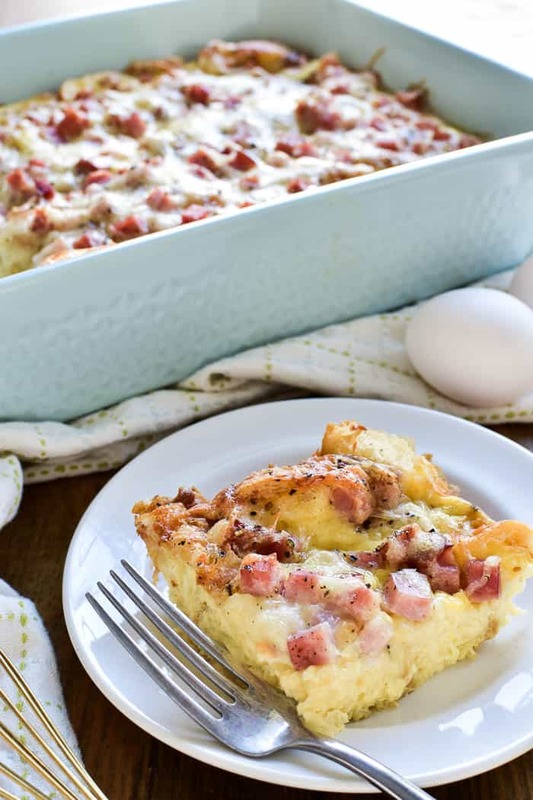 Perfect for Easter brunch, baby showers, or lazy weekend breakfasts, this Ham & Cheese Croissant Egg Bake is sure to become a new favorite! I’m ALL about egg bakes. Seriously….is there anything better? Not only are they easy to prepare and such a delicious way to wake up….but the possibilities for them are endless. From Crustless Quiche Lorraine to Overnight Sausage Egg Casserole, I’ve never met an egg bake I didn’t love. And this Ham & Cheese Croissant Egg Bake? Well, it just might be my new favorite! For one, you can’t go wrong with ham & Swiss. It’s a classic combo for good reason. And then there are the croissants. Yep…you heard me right. Ham + Swiss + eggs + CROISSANTS!!! It’s pretty much heaven in a 9×13 inch pan. And SO easy to make. Especially when you shop at Pick ‘n Save! 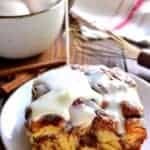 I found everything I needed for this recipe at my local Pick ‘n Save, from the bakery croissants to the locally produced Roundy’s eggs, milk, and cheese. I love having a grocery store I always know I can count on. 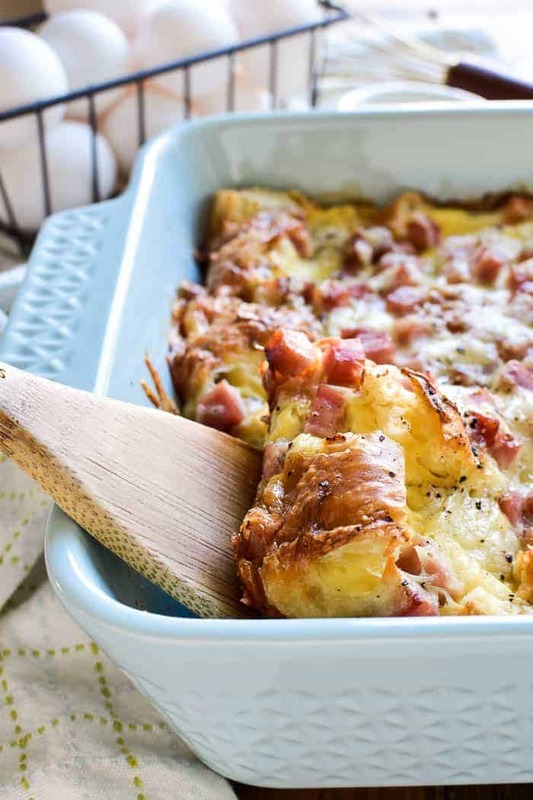 HOW DO YOU MAKE HAM & CHEESE CROISSANT EGG BAKE? Cut croissants into 2 inch cubes and spread them in a 9×13 inch pan. In a medium mixing bowl, combine eggs, milk, sour cream, salt & pepper. Stir in shredded cheese and ham. Pour egg mixture over croissants. WHAT KIND OF HAM IS BEST IN AN EGG BAKE? Feel free to use any kind of ham you have in your fridge, from deli ham to ham steak to leftover Easter ham. 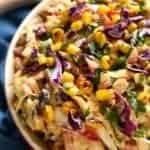 As long as it’s chopped into bite sized pieces, it will work well in this recipe. 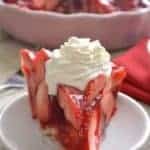 CAN I USE HEAVY CREAM IN THIS RECIPE? Yes, you can feel free to substitute heavy cream or half and half for the milk. Doing so will produce a richer result. Just keep in mind that there’s already a great deal of richness from the croissants, eggs, and Swiss cheese. 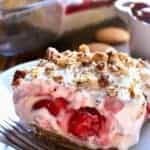 WHAT WOULD GO WELL WITH THIS RECIPE? Leftovers can be stored, covered, in the refrigerator for 3-4 days. You can store them right in the pan (covered with aluminum foil) or in an airtight food storage container. HOW DO YOU REHEAT LEFTOVERS? 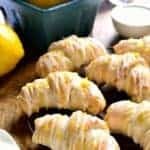 The best way to reheat this recipe is in the oven or toaster oven, both of which allow the croissants to crisp up a bit. However, this dish will also reheat well in the microwave. 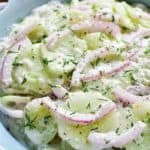 My favorite thing about this recipe, aside from the fact that it’s so deliciously flavorful, is that you make it the night before. Which means no more morning rush! Just wake up, pop it in the oven, and voila. You have yourself an amazing little breakfast. And, not that you needed any more reasons to love this recipe, but it reheats beautifully. So just in case you happen to have any leftovers, you’re good to go! It really doesn’t get any better than that. For more recipe inspiration, visit Pick ‘n Save on Facebook, Pinterest, Twitter, and YouTube. 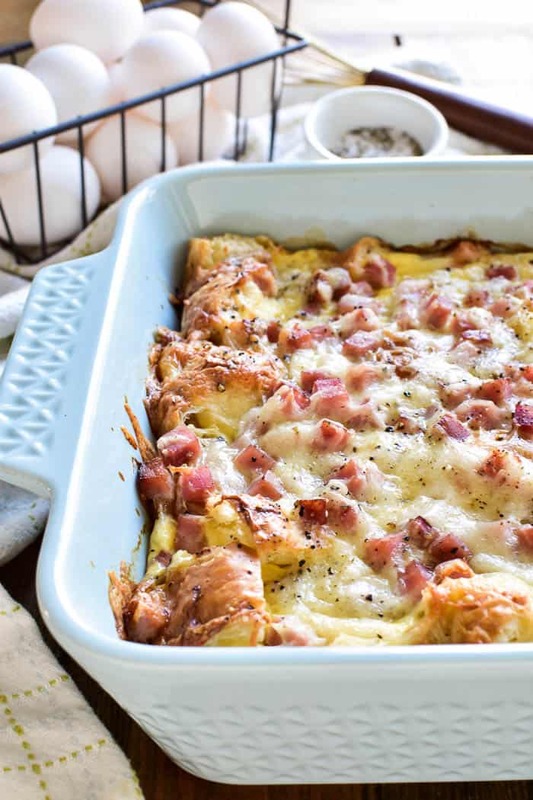 This Ham & Cheese Croissant Egg Bake is the ultimate breakfast dish. 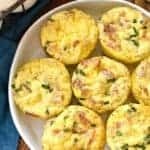 It combines the classic flavors of ham & Swiss in a delicious breakfast strata that's ideal for entertaining. Made with just 8 simple ingredients, this egg bake is prepared the night before and oven-ready when you wake up. 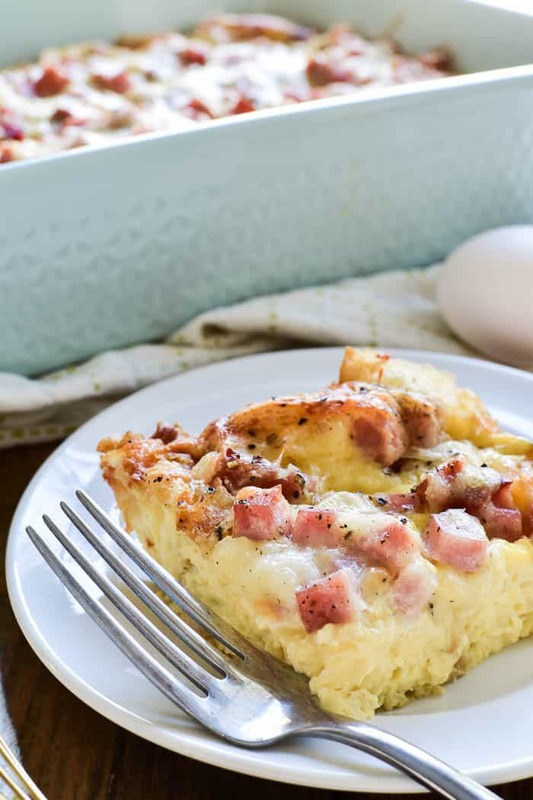 Perfect for Easter brunch, baby showers, or lazy weekend breakfasts, this Ham & Cheese Croissant Egg Bake is sure to become a new favorite! 2. Cut croissants into 2 inch cubes. Spread into the bottom of a greased 9x13 inch pan. 3. In a large mixing bowl, combine eggs, milk, sour cream, salt, and pepper. Whisk well. 4. Stir in shredded cheese and cubed ham. 5. 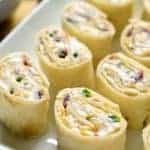 Pour egg mixture over croissants. 7. Bake, uncovered, at 350° for 55-60 minutes until golden brown and puffy. 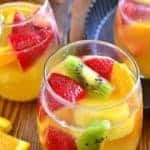 Such a delicious breakfast or brunch idea! These look absolutely amazing ! 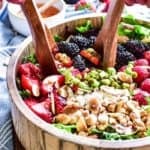 This looks like such a delicious breakfast casserole! I bet the corner pieces are the best!!!! Sounds wonderful! Fabulous idea, and perfect Easter brunch! Love! Such an incredible dish!! My family would LOVE this! Looks so delish! This is my kind of breakfast, definitely having this on our table!